NEW YORK (ForexNewsNow) – The fears of a “double dip recession” in the United States and the ongoing sovereign Debt Crisis in Europe have once again emphasized how important central banks have become in the economic policies of industrialized countries, particularly the United States and countires within the Euro Zone. Since the Subprime Mortgage Crisis began in the summer of 2007, central banks have embarked on a path of innovation and experimentation in their attempt to stimulate the economy through monetary policies. 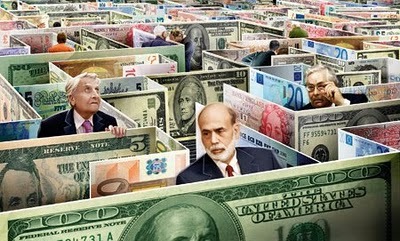 The lowering of interest rates to zero, the injection of huge amounts of liquidity into the market, the purchase of both private and public securities and the comprehensive Quantitative Easing packages are just some of the policies that international institutions such as the Bank of Japan, the Bank of England and the U.S. Federal Reserve have tried. Even the European Central Bank (ECB), whose flexibility is limited by a legislative straitjacket and a deep historical legacy, has also entered into the market to purchase government bonds. While in the beginning the ECB restricted itself to solely the purchase of Greek bonds, the Bank then expanded its scope to include the purchase of Portuguese and Irish bonds as well. Finally, driven by the recent market crash and increasing tensions on bond markets, the ECB has now decided to acquire Spanish and Italian bonds in recent days. The central role of national Banks appears to only be increasing over the next few years due to one simple reason: the state of national debt and financial imbalance will prevent many industrialized countries from pursuing any ambitious fiscal stimulus policies, even simple support of economic activity. Therefore, of the two pillars supporting economic policy, the only one which continues to function normally will be monetary policy. It is for this reason that the Financial Summit being held in Jackson Hole, Wyoming on August 26, has become an event of utmost importance while in the past it only interested a few specialists. Last year, current chairman of the Federal Reserve, Ben Bernanke, launched the city to celebrity status when he announced the possibility of a second round of Quantitative Easing (referred to as “QE2”). Following the Fed’s commitment to two rounds of Quantitative easing QE1 (2008-2010) and QE2 (2010-2011) the Fed’s financial capabilities have now become drastically overstretched – growing from $800 billion before the crisis, to almost $3 trillion in recent weeks! Bernanke’s announcement of QE2 in Jackson Hole, Wyoming last year immediately pushed US bonds down and stock markets up. Since then, the U.S. economy has struggled to recover, even losing one of its Triple-A credit ratings along the way. Therefore many questions are beginning to circulate about the new meeting in Jackson Hole. Will Ben Bernanke announce the launch a third round of Quantitative Easing to boost the US economy? Would QE3 actually even help the US economy or just hurt it more? Should the European Central Bank follow suit? What are the potential risks and payoffs? These are the essential questions that economic analysts must consider when weighing the effect of the upcoming Jackson Hole meeting on the global economy. For Forex brokers and markets especially, the increasing tension surrounding the meeting could provide either excellent, or perhaps disastrous, market conditions for profitable short-term trades.